salvado fermentá, puiru di serámika EM-X i klei. E ta pisa 300 gram ora e ta muhá. E bala di klei EM ta sak bai den bòm i ta desintegrá / kai for di otro. E mikro-organismonan ku ta den e bala ta plama den e awa. Den un par di siman pa un par di luna nan ta trese un balansa den e awa di e veiver. E awa ku mikro-organismo ta keda limpi pa largu tempu. E balanan di klei EM ta sirbi pa limpia i mantené awa (di veiver) limpi. E balanan di klei EM ta mehorá e kalidat di awa i e ambiente di awa en general. Lima ta disparsé i no ta bin bèk i e awa ta bira hèlder. Mata di awa ta bai krese mas lihé ku chèns di krese sera e veiver. Piská i otro organismo di awa ta bai bon den un veiver ku a keda tratá ku bala di klei EM i EM-Aktiva. E bio-diversidat di e veiver lo bai oumentá. Kantidat: 1 Bala di klei EM pa 1 meter kuadrá. The EM Bokashi ball sinks to the bottom and will slowly dissolve. The present micro-organisms in the clay will spread on the bottom and in the water and will bring a great balance in the (pond) water within some weeks to some months. The water with the micro-organisms will remain clean for a longer period of time. 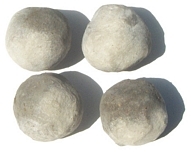 EM Bokashi clay balls are suitable for cleaning (pond) water and keeping it clean. The EM Bokashi clay balls improve the quality of the water and the water environment in general. Algae do not return or disappear and the water becomes clear. Water plants will grow faster (which can cause the pond to “grow thick”). Fish and other aquatic life thrive perfectly in ponds treated with EM Bokashi clay balls and AEM and the biodiversity of the pond will increase. Amount: 1 EM Bokashi clay ball per m2.